Professional sports leagues face several problems when creating policies designed to change behavior. The Rooney Rule is one of several current policies working to add more diversity to the sports world. One policy that has produced change, in spite of continually facing problems, is the NFL’s Rooney Rule, which was adopted in 2003. The rule’s intent was to improve diversity in coaching. The original rule required teams with a coaching vacancy to interview at least one diverse (non-white) candidate for the position. The rule was expanded in 2009 to include interviewing diverse candidate pools for general manager and other front office positions. In December 2018, the rule was strengthened again. The rule now requires teams to interview minority candidates from a list provided by the Career Development Advisory Panel. The panel includes former head coaches Bill Cowher and John Madden. Incorporating the rule helped bring more minorities into NFL coaching positions over the years. However, some in the football world were opposed to the rule initially. Haynes, who at one point worked for the NFL after he retired, said the inclusion of diversity in sports needs to happen organically. Haynes also discussed the faith he has in youth to be able to identify diversity in their communities. He used Arizona State as an example, referring to the school’s large number of female professors, the presence of a black athletic director and football coach. He pointed out those facts would let people know of the school’s commitment to diversity in contrast to a college who just recruited students for diversity and did not have anyone diverse on their staff. Diahann Billings-Burford disagreed with Haynes to an extent. 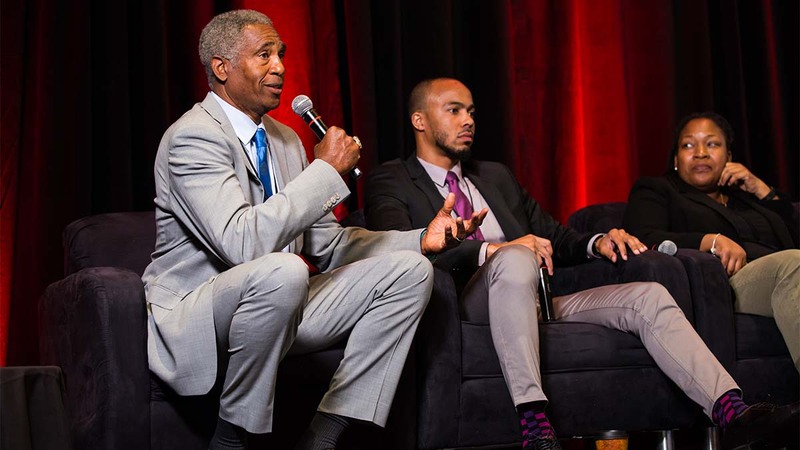 The CEO of Ross Initiative in Sports for Equality (RISE) believes people have to have diversity “put in front of them” if they are to learn to become open and accepting of it. RISE is a national nonprofit dedicated to inspiring sports leaders to promote positive change involving race and equality in athletics. One of the programs RISE conducted recently was called “Rise with the Rams.” It involved the Los Angeles Rams talking about issues of identity, equality, inclusion and implicit bias with young men in the Los Angeles area. The program included Morningside High School in Inglewood, California, and Oaks Christian High School in Westlake Village, California. Vince Pierson, the Director of Diversity and Inclusion for minor league baseball, agreed with both Haynes and Billings-Burford. He discussed the Rooney Rule being a catalyst for change in sports. Major League Baseball deals with some of the same problems. A small percentage of major league players are African Americans. In 2018, opening day rosters had the largest percentage of black players since 2012: 8.4 percent of MLB players are African American. Diversity in sports are at far from ideal levels. However, policies such as the Rooney Rule are making inroads into that problem.